Mark Wahlberg’s Daily Schedule isn’t “Crazy” or “Impressive”! 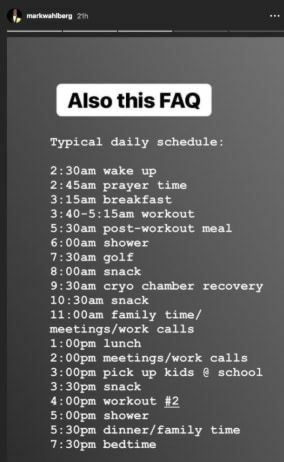 This is Mark Wahlberg’s daily schedule on an average day. All over the media people are saying that his schedule is “insane”. It’s not. 2:30am wake-up time. Do NOT be fooled by this. This is extremely early to get up in the morning but this guy goes to bed at 7:30pm. That is 7 hours of sleep. Not insane at all. He then chills for an hour before hitting the gym for an hour and a half. Between 6am and 4pm he plays golf, takes a few calls, eats and hangs out with his family. This is the time you are working. Then he works out again for an hour. And lastly, he chills with his family until bed time. So.. 7 hours of sleep, 2 workouts and the rest of the day he hangs out / makes a few phone calls. WOW, how does he do it all! ?